"This recipe is a bite-sized version of Carnegie Deli's most popular menu item, the Woody Allen Sandwich. Only a slight departure from the monster-sized menu staple, these RITZ mini sandwiches are flaky, delicious and fun to prepare. 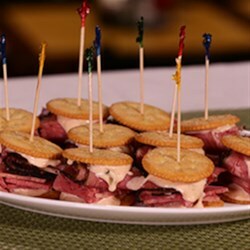 Using Carnegie Deli's signature ingredients like Pastrami, Corned Beef, and homemade Russian dressing, your guests will feel like this party snack is straight from the deli counter." To make Russian Dressing, blend together the mayonnaise, ketchup, relish, lemon juice, Worcestershire sauce, salt, and pepper. Stir until smooth. Place 10 RITZ Crackers on tray. Put about 1/4 tsp Russian dressing onto each cracker. Cut corned beef and pastrami deli slices in half vertically. Put two pieces each of corned beef and pastrami on each cracker. Top with additional 1/4 tsp Russian dressing and remaining crackers to form sandwich. Can be served open face. Can use one meat if that is preferred. Can be served with pickles. These were delicious! I added a slice of swiss cheese layered in between the meats. Super tasty! These are quick and easy to make! The homemade russian dressing is delicious with the pastrami and corned beef. It is easy to assemble. I prefer it opened faced because it is easier to eat. 4-15-14: Pretty good taste, great appearance. Insane! Only Carnegie Deli could come up with this. I doubles the meat and made it twice as good.